I had been having a cold for the past week. Gladly and finally I've past it on to someone else. I know my cold germs had found someone new to mess with and I am out from the torturous runny nose and sneezing. Now to see the poor sickling wrapping "wontons". I felt bad that I was actually happy about it. 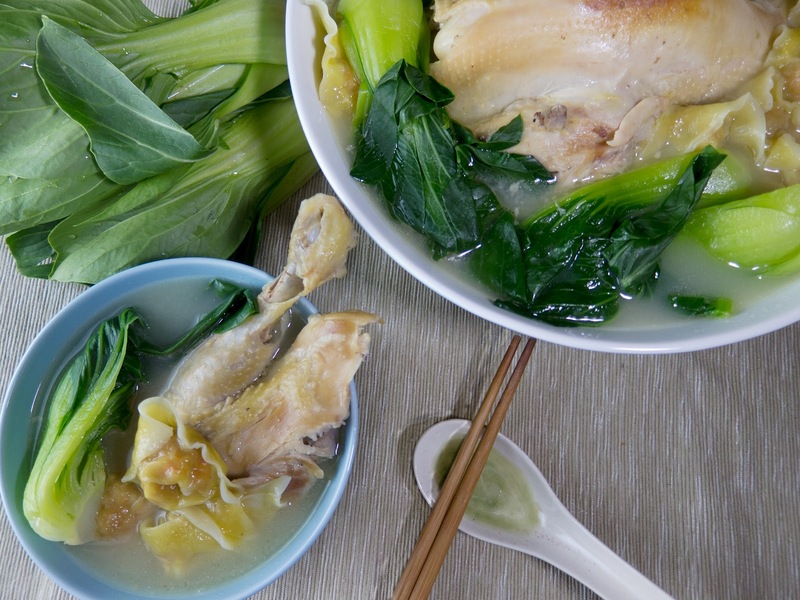 Hence tonight, the chicken wonton soup to make you feel better. As the old saying goes…chicken soup cures all sickness. Let's see if the soup works. The chicken soup is tastiest when you can find a free-range old hen.The broth is golden yellow and there's a rich sticky film on your lips with you press them together. I don't think I can find such hen in Singapore and I do kind of miss the process of choosing a plump old hen from the market. The chicken lady pulls the chosen hen out of the crowded cage by the wings. Hanging her in an awkward position. A lock down as the hen struggles with her continuous "buks".The chicken lady prompt you to join in and pock the thigh as well. It feels plump beneath the smooth feathers, I always nod agreeingly with her trying to pretend to know. The hen is tagged. Cash and a token exchange hands and the chicken lady will ask me to come back in 10 minutes. The hen is sent to the back where the whole process is still visible. It happens so quickly. For a moment I feel sorry. A slit at the throat, she is thrown into an oil drum like tank to drain off the blood. After a few minutes, the lifeless hen is lifted and dipped into a hot bath to aid the plucking of feathers. Another lady plucks the feathers and cleans up the chicken. My naked hen is bagged and my number is called. The chicken soup is so easy. Throw everything into a pot, cover with water and simmer away. After a few hours, the golden broth adorns upon you. We will eat the chicken as well. Dipping it in soy sauce mixture. The meat is so tender and flavorful. The chicken wonton soup is a meal itself. 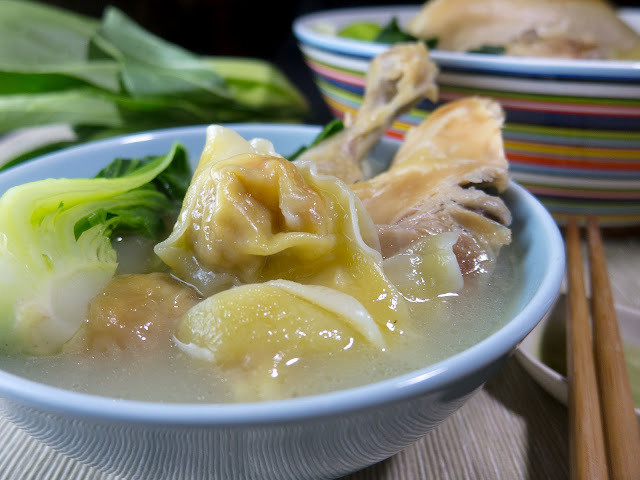 The pillowy globs of wonton in chicken soup as to resemble clouds. It's amazing delicious, healthy and simple to make. 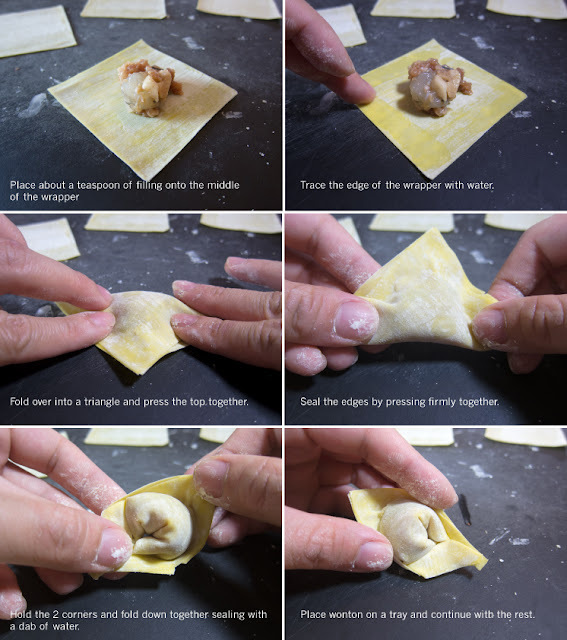 It takes a little time to make the wontons themselves, but the process is easy enough to do. Soon enough you'll have trays of these little golden ingots to be stashed away in the freezer for any midnight snacks. 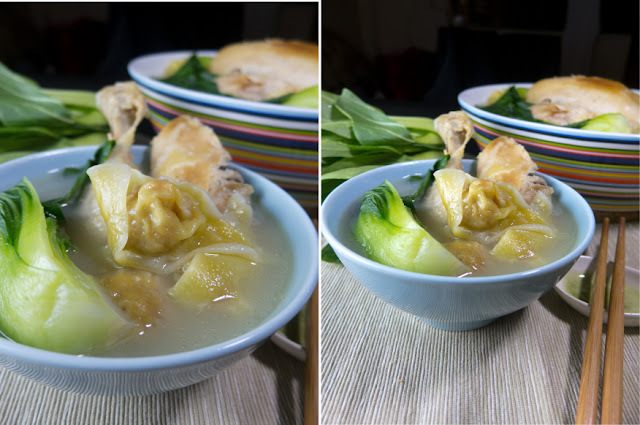 There are the Cantonese style wonton soup. 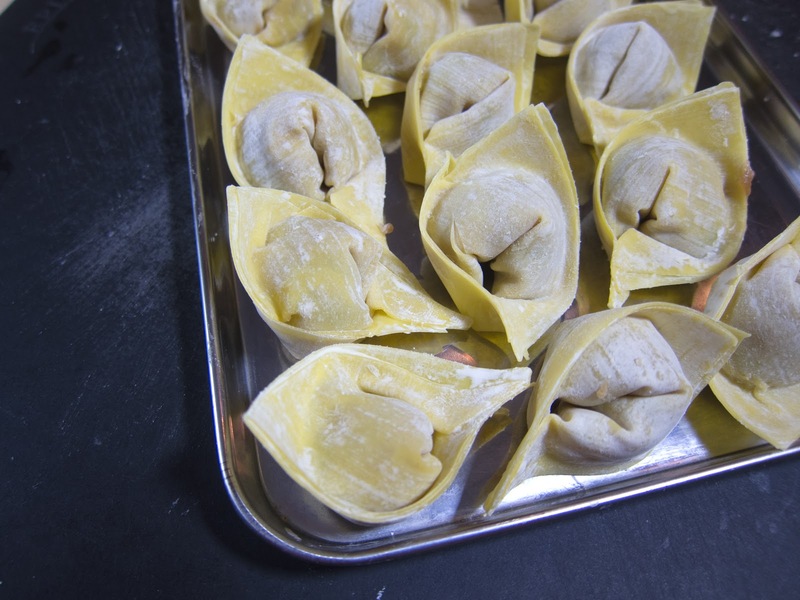 Usually made with shrimp wontons (yellow skins wrappers) on a clear brownish broth with yellow chives. There's also another version where the broth is abit milkish and the wonton is made with pork or a mixture of chopped up pork and shrimp; surrounding with bouquets of bok choy. A very traditional soup in China. Place all the ingredients in a pot. Add enough water to cover the chicken and bring to boil. When boil, turn down heat until it is a low simmer. Simmer for 3-4 hours. Season with salt. In a large bowl, combine pork, shrimp, chestnut, minced garlic and ginger. Mix together with a spoon in 1 direction for 10 mins or until it is sticky and bouncy. Let marinade for 25 to 30 minutes in the refrigerator. In large saucepan, Add bok choy; cook for 1 minute or until tender. Drain the bok choy and set aside. In same saucepan, bring water back to boil. Add wontons and boil for about 5 minutes or until cooked through and risen to top. With slotted spoon, transfer to a large soup bowl. Bring the chicken soup to boil. 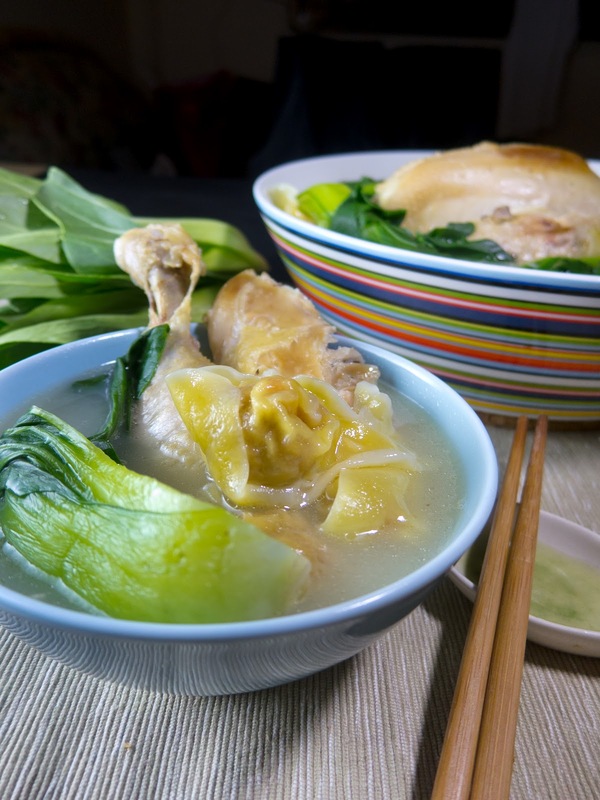 Transfer the chicken to the large soup bowl with the reserved wontons. 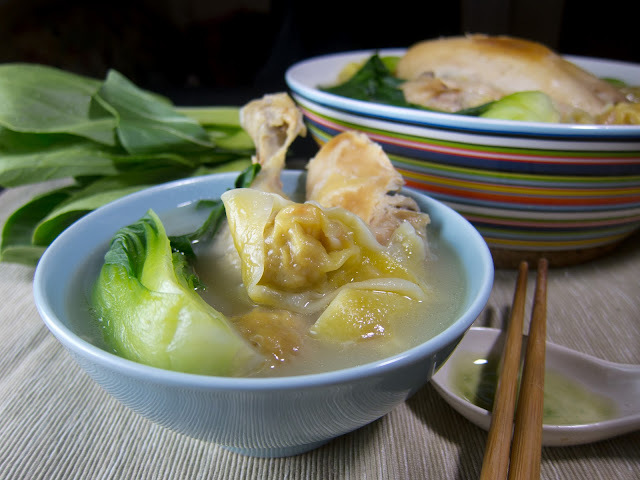 Place bok choy and ladle soup over wontons. Serve immediately. Mix everything and let marinade.